I have had the most fun working on this pretty project! I bought the stems (that I have always wanted but couldn't afford) at Michael's because I had 70% off!! That's the only reason I could get the ones I always wanted! I'm telling you, watch the ads, wait and go in when you have a extra percentage off coupon pulled up on your smartphone! I thought I bought them to make my Spring into Summer Wreath for my front door. As I was working, separating the stems, I realized how much sheer volume I had and quickly was aware that I could make more than just the wreath out of them! Woohoo!! So my brain started racing with ideas of what else I could do with this abundance of beauty! Across the table from me, was this beautiful antiques script scrapbook paper, (one of my favorites!) that I had left over from an earlier project and directly in front of me was my spool of natural twine!! well, that's all there was to it! 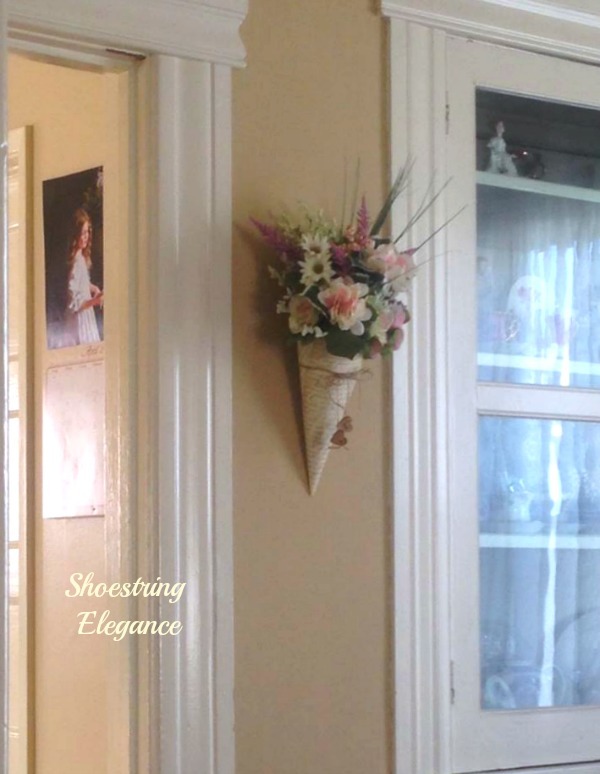 I had to make a floral cone that I could hang in the house too! I should tell you that this was a very simple cone roll of the paper, glue or double stick tape the seam in the back. Just as you would make a frosting bag. Punch your holes for the twine to go through. I do put tape on the inside and outside of where I'm punching my holes to give it the strength needed. These are the florals that I bought for, what will be two rather large projects! Grand total for all this beauty was $15.78!! So, I couldn't say "make your own for under $15 really. But considering that it took less than half for the cone and I have plenty for the wreath I can say, Look what you can make for under $8!! Better, yet, right?! This is my view now of it from my desk in my room. What wonderful smiles it brings me! What's bringing you joy around your house? I hope that you all are taking time to celebrate the changes of the seasons and find some way to make it special in your home and garden or even on your door. I hope that you will enjoy this as much as I am. 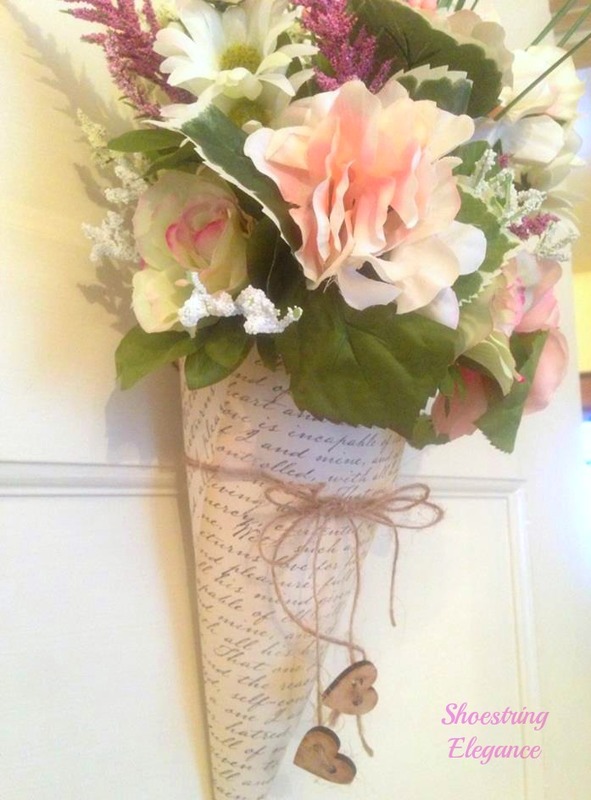 Even though, I made this pretty little cone for my home, don't you think it would be a great Mother's Day gift or a May Day surprise for a friend?! Think I'm going to make another one to bless a friend's home. That's gorgeous! And, those flowers were a steal! 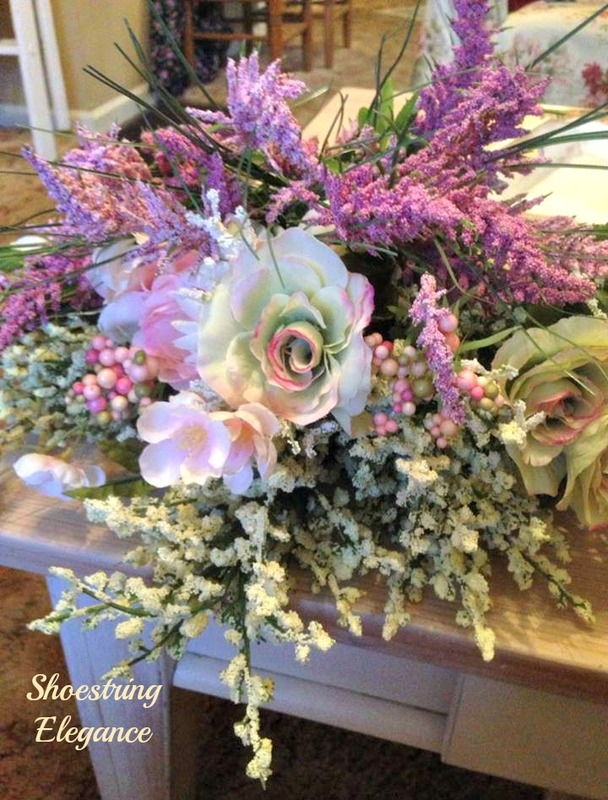 Pretty, pretty spring bouquet.... You are talented, my friend! I love you, Heather! Thanks you so very much! Hello! Dropping by from Home and Garden Thursday blog party. Your floral form looks so pretty. I like it! Thanks for sharing and have a nice day! Thank you so much, Mayje! I'm so pleased you liked it! Thanks for visiting! Have a great weekend, girls....I will be back next week to link up! Thanks JP, I'll look forward to seeing you! That looks just lovely hanging on your wall. Did you say how you hung it? Did you have any kind of liner in the paper or did you just go with what ya had? 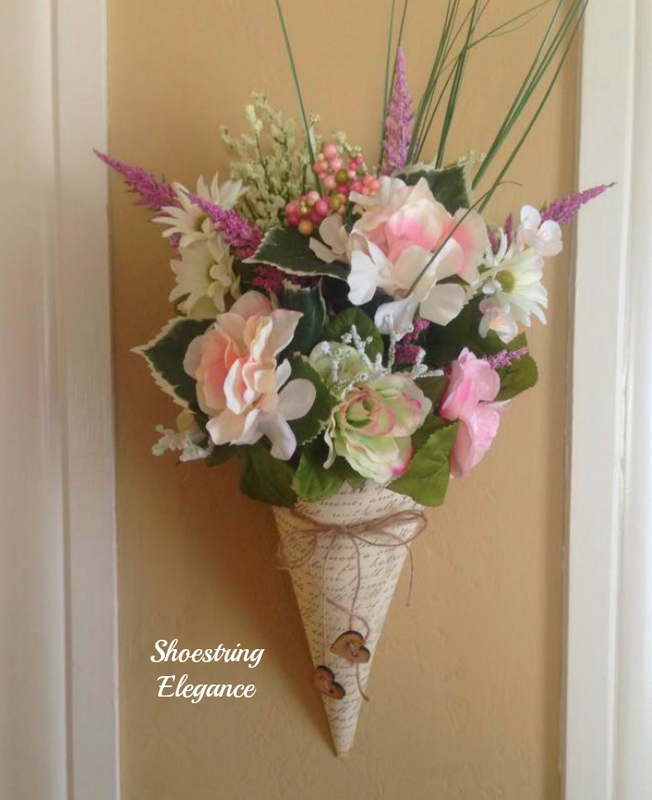 Beautiful floral cone! Hi, Dana! Thank you for your kind comment. Yes, I did say how I hung it. About the middle of the 1st paragraph. I used tape on both the inside & outside of the paper, in the back, before punching the wholes. That seemed to be enough for this weight of florals. I hope you make one for yourself! You have done an excellent job with your pretty touches of flowers. Thank you so much, LV!! I'm so glad you had a chance to pop over and see them! Laura, You should totally make one! They are so fun! Happy Pinks! The cone is so pretty Theresa and now you'll have twice the beauty with two projects. Thanks for sharing at Shabbilicious Friday. Thank you so much, Kerryanne. Thank you so much, Diane. Yes, you are right, it does very much have that Victorian feel. 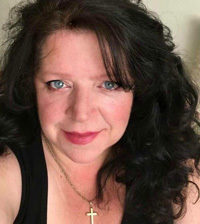 Gorgeous, Theresa! Those coupons are great, aren't they? I love the way you put this together. So soft and pretty. 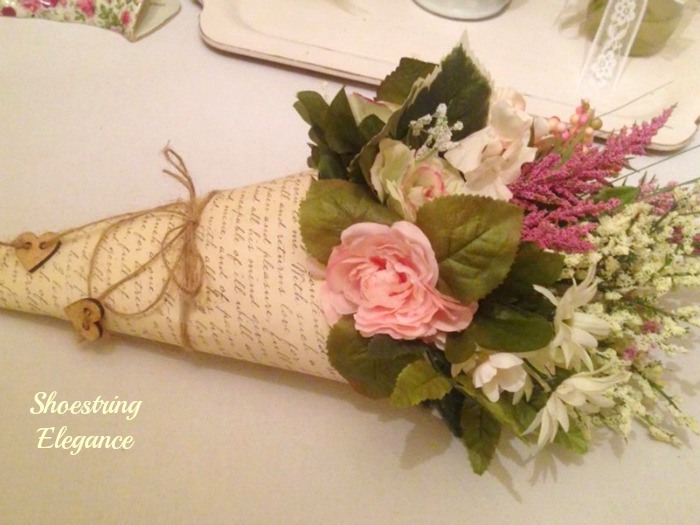 I'm so happy you shared in with us on the Spring Craft Blog Hop. Thank you so much, Cindy! I'm so glad! I was so happy to get to share with you! Theresa it turned out so pretty! Thank you so much, Pamela. I'm so glad you were able to come visit! This is just beautiful Theresa! Thank you for sharing it with us! Congratulations - you are one of our Featured Guests at this week's Inspire Me Monday party at Create With Joy! Ramona, Thank you so very much!! I am honored and have quickly gone and grabbed your button! I am please and honored beyond words. It's lovely, Theresa! I'm visiting from Create with JOY. I'm so pleased to have found your blog! Thanks so much, June! I'm so glad you visited. I hope you'll come back! Congrats on being featured this week on Inspire Me Monday. It's nice to meet you. 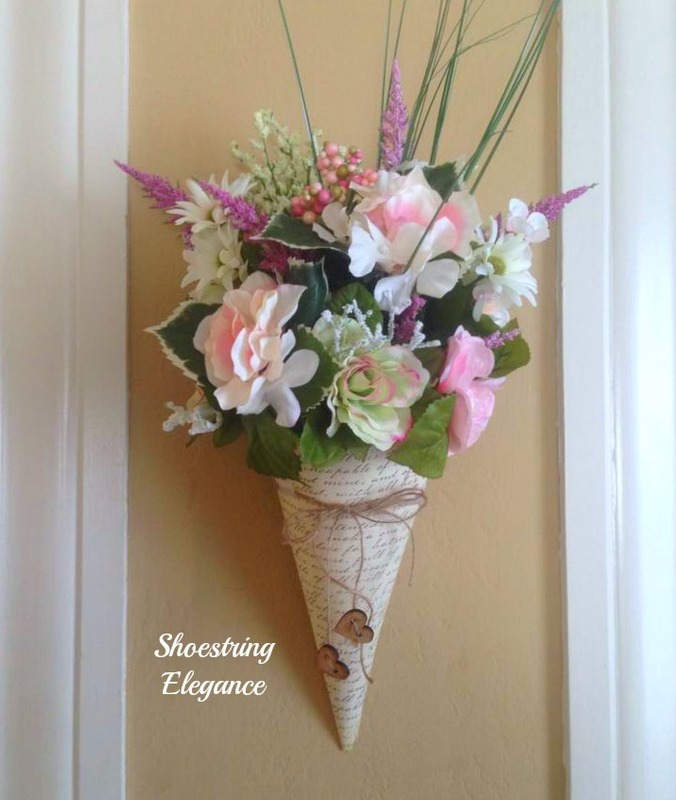 Now, let me say, this floral cone is really gorgeous! I use to love DIY projects like this, but honestly I haven't done anything like it in years. My interests migrated to making hand-stamped cards, but I don't do that nearly as much as I once did. You are quite talented and have a natural eye. I know it gives you lots of joy to create and enjoy your handy work. Have inspiration filled week! Thank you so much, Cathy, your kind comment means so much! So nice to meet you, too! I'm so glad you found me! Yes, I do love what I do! If you have any recent projects please come back and share them with me @ my party! It starts Thursday night @10/7pm pst. May you have an Inspired week, as well! This is so pretty! Thanks for sharing at What'd You Do This Weekend? I hope you'll join us again this Monday! Thank so very much Joy!! Very pretty Theresa! Thanks for linking with Home Sweet Home! Very Beautiful Theresa, and what a nice door ornament it makes. Lovely! Love the lil heart dangling off of it too.